In celebrating their tradition of promoting and organizing world-class events, Worldbex Services International (WSI), in cooperation with ABS CBN, brings you the 12th World Bazaar Festival! The year’s longest and grandest Christmas charity bazaar’s back from December 7 to 23, at the World Trade Center – Metro Manila. Drop in from Mon to Thurs – 12nn to 10pm and Fri to Sun 10am to 12mn for the opportunity to experience full blast shopping while being entertained by different shows and attractions provided by ABS-CBN talents live on stage! Relax and enjoy yourselves as you shop and dine in this Christmas shopping haven for the benefit of your family and ABS-CBN Foundation, Inc. The World Bazaar Festival will be featuring over 800 booths from the country’s top retail brands covering everything from toys to gadgets to books to handicrafts, kitchen wares, house wares and other wares you might have in mind. The bazaar is a Christmas shopping bonanza where people can lose themselves in fabulous finds, delicious food and interactive activities. 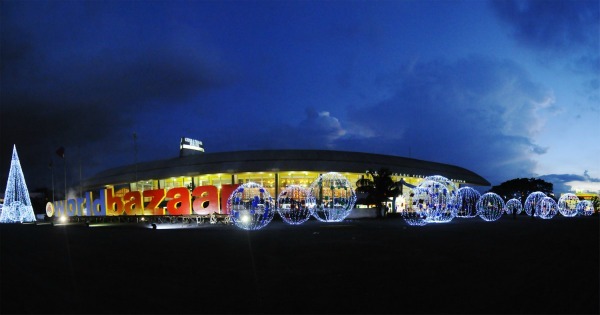 With over 618 participating companies and a 25,000 square meter shopping area for 230,000 shoppers, this bazaar will surely give you what you need. Enjoy live acoustic music as you sit down for gastronomic delights at Woobie’s Food World where over 100 booths are all selling delectable and sumptuous food, perfect for taking your palette on a roller-coaster ride! Be updated with the latest Kapamilya shows as ABS CBN launches their 2013 programs for everyone to enjoy at the event. You can also gorge on home-made desserts and munchies for sharing and giving this coming Christmas time at Woobie’s Goodies where pavilions of baked organic goods and snacks are available for sale. 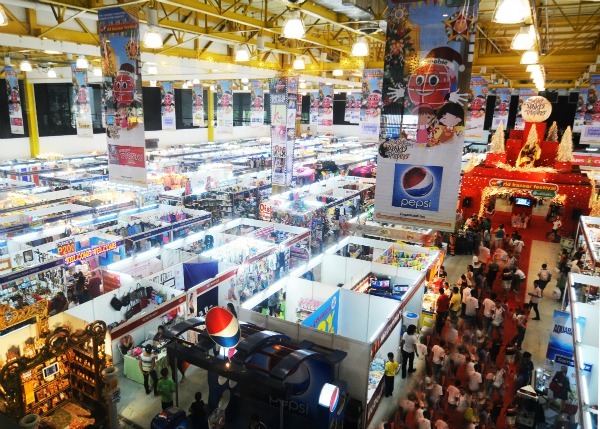 The 12th World Bazaar Festival will also showcase top brands in Designers Avenue like Rustan’s, Rayban, Rudy Project, Converse, Celine, CMG group, Play and Display, Goody, Hang Ten, Enfant, Adidas, Puma, FILA, Converse, Triumph and unique, hard to find Christmas decorations and ornaments from the Christmas Decors Producers and Exporters Association of the Philippines. As a token of WSI’s goodwill and in partnership with East West Bank, there will raffles held during the event. They’ll be giving away iPads, home appliances, PS3s and many more. Woobie, the official mascot of the World Bazaar Festival, will also be around to giveaway toys and goodies to some lucky boys and girls all throughout the event! Woobie supports charity activities and fund raising events for those in need. Ever ready to help out with a smile on his face, Woobie embodies the Christmas spirit for the World Bazaar Festival. Some Kapamilya stars will also share in the holiday spirit as they sell their personal clothes and belongings for charity in the Celebrity Pavilion. “Last year’s World Bazaar Festival was an overwhelming success, with thousands of people pouring in to shop their hearts out with our wide selection of products. This year, we look forward to organizing a Christmas charity bazaar that’s bigger and better than before with all our new highlights,” JR Ang, Worldbex Marketing Director, shares. 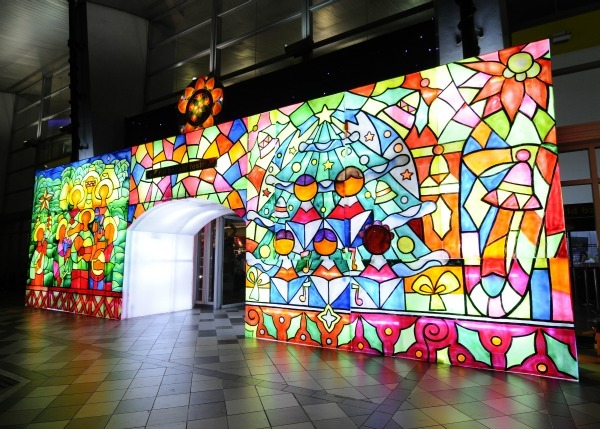 This year, there will be two weekend highlights for the World Bazaar Festival. Get the chance to grab all the hottest tech as top suppliers of gadgets and electronics gather to put together the best shopping experience for you in the Appliance & Gadgets Craze. Meet and greet your favorite bloggers in Bloggers Block, done in cooperation with Bloggers United, where the top bloggers will pool together for a weekend blog hopping attraction with names such as Laureen Uy, Divine Lee, Camille Co, Victor Basa, David Guison, Lissa Kahayon and Kryz Uy to name a few! Both are pocket events which will happen simultaneously in the WTCMM East Wing. To help shoppers with their Christmas shopping, the organizers will be giving away eco tote bags and provide sufficient parking for everyone within the CITEM area. Shuttles are available round the clock from opening till after closing hours. More ATM slots and Credit Card terminals are also within the event’s space. Tickets will be available for sale on-site from 12nn to 10pm during Monday to Thursday and 10am to 12mn during Friday to Sunday. Shopping for a cause has never been so much fun. So come on down and celebrate this yuletide season with the 12th World Bazaar Festival for the benefit of the ABS CBN Foundation Inc. this December 7 to 23 at the World Trade Center Metro Manila. The 12th World Bazaar Festival is once again brought to you by Worldbex Services International, the leading events company who continues to deliver world-class events for every Filipino to enjoy. 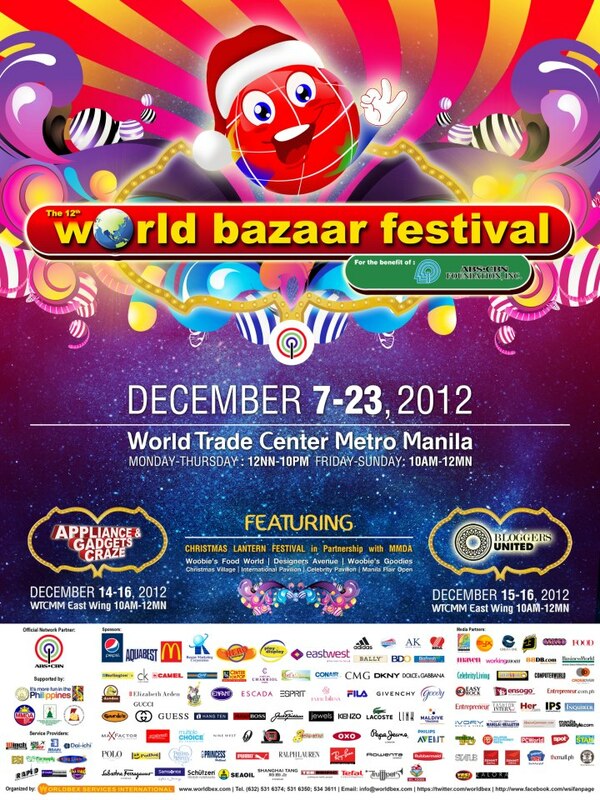 Want to win tickets to the 12th World Bazaar Festival? Will announce winners through my blog so stay posted! I'm Kim :) I've been a follower of your blog. Hehe!